So I was finally able to get my hands on the LG-made, Google Nexus 4 and I have been using it for about a month, now. It’s been a long time coming, but LG has done an absolutely horrid job of keeping it in stock. The only nice thing that came out of the ordering procedure was when it finally shipped (after about a week), Google was nice enough to upgrade my shipping to same day, which was good. Once I got the device though, I was stunned. As I took it out of the box, I was shocked at how gorgeous the device was. With absolutely nothing on the front besides the screen, it’s obvious that Google is going for a really simple understated design. Check out my review below. Design: With glass on the front and back, it’s easy to see the design cues that the Nexus 4 took from the iPhone 4 and 4S. The problem with the iPhone though, was that it was very fragile. The nexus has Gorilla Glass 2 on both the front and the back, so this should help keep it relatively durable, although, I would still highly recommend picking up a case. The sides are made of a grippy, rubber feeling material that helped make it easier to hold. There is a chrome frame around the front of the device which really adds to the style that Google is going for. On the front, there are absolutely no buttons, no logos and no carrier branding (thank god). It is one of the cleanest designed phones I have ever used. The biggest design feature is definitely the holographic sparkle pattern that shows up on the back of the device. It’s behind the glass so it doesn’t take away from the experience, but it looks very stylish. Performance: The Nexus 4 ships with a Qualcomm Snapdragon S4 Pro CPU. This is a 1.5ghz quad core cpu. In other words it’s REALLY good. This is BY FAR the fastest phone I have ever used. Apps open almost instantaneously. It’s almost as if there is no loading. Because of its’ 2 Gigabytes of ram, you can open up as many apps as you’d like and multitask without slowing down the phone in the slightest. Gaming is also really good because of its Adreno 320 GPU which is as good, if not better than the GPU in the iPhone 5, so gaming looks beautiful and performs great. 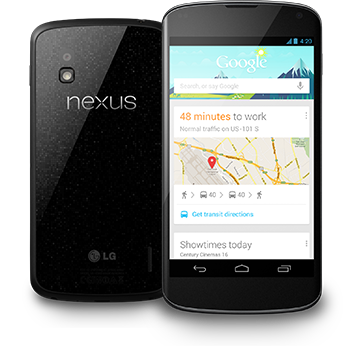 Screen: Rivaling the likes of the Samsung Galaxy S3, the Nexus 4 has a 4.7″ Super LCD 2 IPS display. This is the exact same display technology that Apple uses with their iPhones and HTC with their One X flagship phone. This display means incredibly wide viewing angles and extremely true to life colors. With a resolution of 1280 x 768, the Nexus 4 clocks in with a pixel density of 320 PPI (the iPhone’s is 326 PPI), so when you use the Nexus 4 you’re going to see super sharp images, really crisp text and incredibly clear videos. Software: The Nexus 4 runs Android 4.2 Jelly Bean. This version brings quick settings in the notification bar, lock screen widgets, gesture typing and a totally redesigned camera app with 360 degree panoramas. Because this is a Nexus device (made by Google), it will always run the latest version of android for 3 or 4 years to come, which is an extra perk for your investment. The Nexus 4 is completely supported by Google and is the most optimized, fast experience you will get from an android phone. Battery Life: This is something that many, many companies overlook these days. In my opinion, this year should be the year of the battery, where all the tech companies put their effort into attaining much better battery life instead of squeezing out the slightest bit of performance. The Nexus 4’s battery is pretty good. It gets me through the day with heavy usage and 45 – 50% remaining when I put it on the charger at 11:30. Although it is not any better (or any worse) than the iPhone 5 or Galaxy S3, it certainly isn’t bad. Camera Nexus devices have always had a history of having really average cameras. Although LG did attempt to change this, they didn’t do as good a job as they could’ve. Don’t get me wrong; the camera isn’t bad! I was actually very impressed with the 8 megapixel photos and the 1080p HD videos it produced. The low light performance was pretty decent, rivaling the iPhone, but don’t expect it to compete against the new HTC one’s incredible camera. The Final Verdict – Although this phone isn’t available through a carrier (other than T-Mobile), it is available for a really good price. At only $300 for the unlocked version from Google Play, it is one of the cheapest unlocked smartphones that you can buy brand new. From there, you can then pop in any GSM sim card and you’re good to go. What you get for the price is incredible. I highly recommend this device for anyone who wants a well designed, fast, beautiful android phone.